After all the media attention that EVOO has received in the past few years, you would think that another cookbook solely devoted to olive oil would be superfluous. 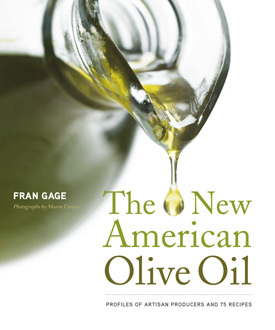 But dig into The New American Olive Oil by author Fran Gage, and you will find there is still much to learn about this versatile kitchen staple – especially about the new breed of American olive oil producers who are dedicated to creating a homegrown product equal to any other on the world stage. The noted author of classics such as Bread and Chocolate and Sweet Obsession has returned with another book that combines great storytelling with delicious recipes – a trademark of her writing style. Gage begins with an informative chapter on the basics of olive oil and then offers up mostly Mediterranean-style dishes that are a healthy blend of simple creations and inventive new takes on old classics. Scattered throughout the book, Gage relates 15 charming profiles of leading American olive oil producers, bringing personality and life to the essence of what makes extra virgin olive oil such an important part of today’s pantry.